Born in Akron, Ohio, Gus “Honeycomb” Johnson attended the University of Idaho where he played forward and center on the basketball team. In 1963, Johnson was picked in the 2nd round of the NBA draft by the Baltimore Bullets where he played nine strong seasons. That same year, he made the NBA’s All-Rookie team, averaging more than 17 points per game. In 1973, Johnson was recruited by his Baltimore coach Bob Leonard to star on ABA’s Indiana Pacers. 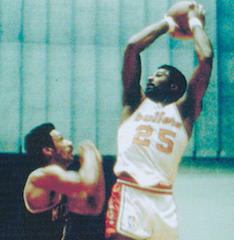 When Johnson played for the Bullets he was named to five NBA All-Star teams, and his #25 jersey was retired by the organization. He was also a member of the Pacer’s 1972-1973 ABA championship team. Throughout his career, Johnson was known for his powerful dunks which caused him to break three backboards over the years. Gus Johnson died at 48 on April 29, 1987 from cancer, but has remained a legendary basketball player born and raised in Ohio. He was inducted into the Naismith Hall of Fame in 2010. View the acceptance speech given by his brother at his Naismith Hall of Fame enshrinement.